One of the best things about iTunes is the ability to make smart playlists to group content according to simple conditions. In this week’s column, I look at two questions about smart playlists: one about listening to different podcasts in chronological order, and another about the Category condition. I also look at how to redownload previous purchases, and how to fix in issue where the Apple TV won’t play surround sound from ripped DVDs. Q: I subscribe to multiple podcasts and can’t figure out a way to play them all in chronological order on my iPod classic. I can play each podcast in order, but not all of the podcasts in total in order. Say I subscribe to three podcasts, A, B & C, and I sync my iPod once a week, is there a way to play them in the following order? A. A smart playlist can solve this problem. Create a new smart playlist (File > New Smart Playlist), and set the first condition to Media Kind is Podcast. If you want, you can limit the playlist to contain a number of items. Click OK to save the smart playlist. A smart playlist can help you sort your podcast episodes by the date they were added to your iTunes library. Select the playlist in iTunes, then press Command-J to display the View Options window. Check Date Added, then close this window. Click the column header above Date Added in the playlist’s window to sort by that date. Click again to sort in the opposite direction. So you can choose to have the playlist display and play the podcast episodes in either chronological order or reverse chronological order. Sync this playlist to your iPod classic and you’ll be able to play the podcasts in order. I would also recommend adding a second condition after Media Kind is Podcast. If you add Plays is 0, then once you’ve listened to a podcast, it will no longer show up in the playlist. As you add more podcast episodes to your iTunes library, the unlistened ones will automatically be added to this playlist. Q: When you create a smart playlist, one of the fields you can use for a match is “Category.” However, when I bring up the info for my song tracks, I see no Category field that I can fill in to use in future playlist searches. How do I use the Category field? A. First, these conditions and smart playlists are not only for music. Some of them are for movies, videos, podcasts, and audiobooks. The View Options window shows the conditions that you can use when creating smart playlists. You can see most of these conditions by looking at iTunes’ View Options window (some of these are not available as smart playlist conditions). This shows 41 different conditions that you can use in a smart playlist; there are a few others that you can choose which describe your files. These are Album Artwork, which lets you find files that contain artwork or not; Checked, which finds files where you’ve checked the little box next to their names; Compilation, which finds songs that are part of an album considered to be a compilation; Location, which lets you find files that are on your computer or in the cloud; and Purchased, which matches files you’ve purchased from the iTunes Store. As for Category, it’s used for content such as podcasts and iTunes U content, but I rarely see it applied. It is not a tag that you can apply yourself, so it’s not very useful. Q: For over 10 years I have been purchasing music from iTunes. Unfortunately, I never backed up my music collection to an external hard drive. Is there any record in the iTunes store of the purchases I have made over the years so I can redownload that music? A. Well, as you said, “unfortunately” you never backed up your music. I think the first thing to think of for the future is to back up your iTunes library regularly. I recommend you read this article, Back up your iTunes media files, to learn how to do that. As for redownloading your music, this has been possible for the past few years. Go to the iTunes store, and click on Purchased in the Quick Links section at the right of the window. Sign in to your account, then click Music. You’ll find a list of all your purchases here, and you can download entire albums or individual songs. Note that some of the music you bought from the iTunes Store may no longer be available. I found this to be the case for several albums, and even individual songs on certain albums (but those were live classical recordings that were sold on iTunes, and that don’t exist as albums on their own). This seems to be even more common with movies. For this reason, it’s a good idea to always back up the content you purchase from the iTunes Store. While you can download most of it at a later date, some may disappear. Q: From an Apple TV, I can play a surround track on an HD movie that I stream from the Apple Store cloud, but if I try to play the same movie from my iTunes library, via Home Sharing, then I can play only the stereo track. On the Apple TV, if I set Settings > Audio & Video > Dolby Digital to On or Automatic, I get silence and the receiver does not recognize the sound track. If I set Dolby Digital to Off then Apple TV plays the stereo track. How do I get Apple TV to play the Dolby track on an HD movie on my computer running iTunes? You can use an app like the free Subler to change the name of the surround sound audio track to Sound, or Sound Track, and the Apple TV will recognize it, and will play it correctly. Also, the surround sound track must be disabled (unchecked). To do this, open Subler then drag a file on its icon, or select it after choosing File > Open, or pressing Command-O. If there is a surround sound audio track, you will see it listed in the top section of Subler’s window. 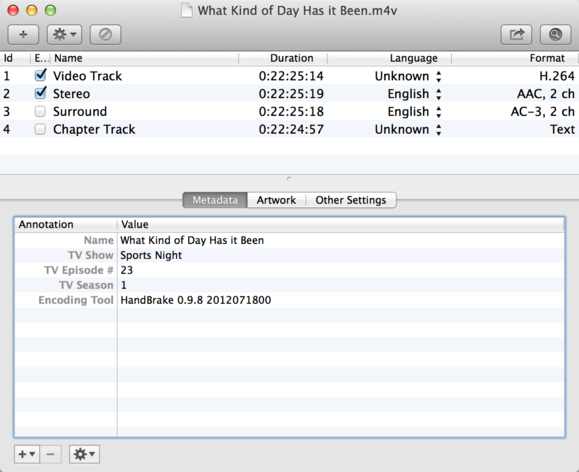 Double-click the name of the track and rename it Sound or Sound Track. Close the window and click Save when prompted by Subler. Subler lets you rename audio tracks in your video files. Remember, the Dolby Digital settings on the Apple TV must be set to Automatic for this track to be played correctly.